"A portrait photographer is something that you are by nature and express by cultivated talent", says Gabi about her area of expertise. My mission is "to reflect my love for people and life through my photographs." Gabriele von Gans, Vienna born artist, international photographer, singer, model, teacher, and speaker is based in York Region, Ontario, Canada. Gabi is passionate about people, animals, wine, organic food and the environment. She has combined her love for design, fashion, lighting, drawing, and painting into her photographs. After thousands of portraits, countless "on location" sessions and weddings, Gabi's earthy quick wit is infamous far beyond her circle of clients. Musicians, artists, atheletes, business people and the fashionistas of the world have smiled for her camera. Gabi follows families from engagement to wedding, baby belly to new family and portraits of elders. 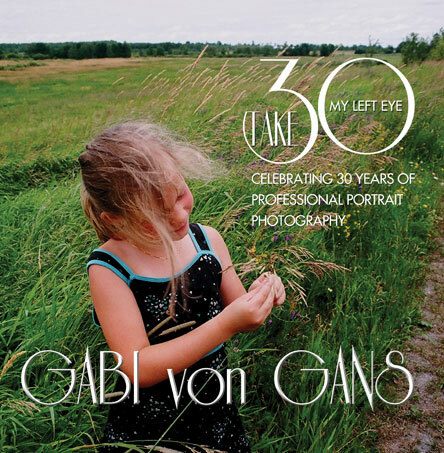 She has always regarded her job behind the lens as a privilege and has released her 30th anniversary collection My Left Eye - Take 30.